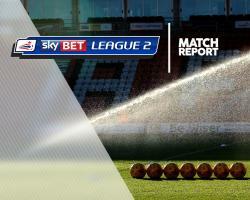 Hartlepool dropped into the Sky Bet League Two relegation places as they slumped to a flat 2-0 home defeat to Barnet. Newport's win over Accrington sees the Exiles leapfrog Pools, putting them two points in front with two games remaining. Victory for Barnet, under caretaker boss Rossi Eames, was only their second win in 13 games. But they controlled the game throughout against a side lacking in confidence, belief and ability. John Akinde was denied an opener after 12 minutes as his angled header was tipped over for a corner. From the set-piece Michael Nelson, the Barnet skipper, fired a shot against a post after 13 minutes, while Jack Taylor's goal-bound shot was deflected wide. Nathan Thomas got Pools' first shot on target after 64 minutes, failing to test goalkeeper Josh Vickers. And the Bees went ahead in the 66th minute when Akinde turned and powerfully fired an angled drive past goalkeeper Joe Fryer. Simeon Akinola made it two after 71 minutes, the Bees racing away down the left side and Jamal Campbell-Ryce setting up the substitute. Akinde also missed a penalty, Fryer saving his weak spot kick with nine minutes remaining.